I believe in the power of a dance practice to hone awareness, offer contemplative space, break down assumptions, and cultivate both wonder and humility. 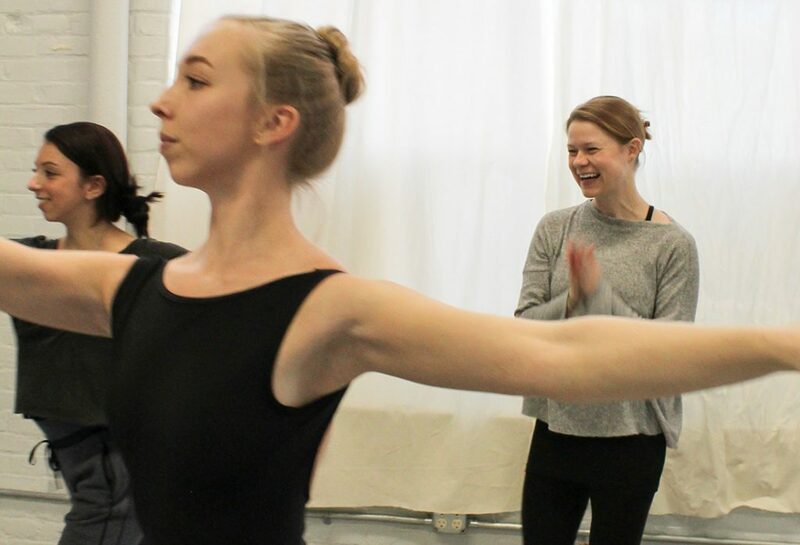 To study dance is to engage in improvisational thinking, to collaborate, and to better understand the body’s capacity to hold our questions and our histories. is a meeting point for my evolving expertise and my students’ emerging questions. The relationship that grows out of that meeting is rigorous, responsive, and thoughtful, and it inclines toward conversation and integration with other art disciplines and philosophies. I value rigorous technical training and musicality, but also emphasize improvisation and experimentation. I often tell my students “I want this classroom to be a place where you come to do your work, not to reiterate or emulate mine.” My classes call for both mental agility and physical coordination, which makes room for students to become versatile and autonomous in their practice. is consent-based, meaning that I frame all classroom exercises as invitations rather than demands, and I do not make assumptions about students’ comfort levels with situations particular to a dance class such as physical touch or partner work. I encourage my students to define their own intentions for each class, and allow them to discern their own thresholds and limits. My goal is to challenge students without overwhelming them, paving the way for attentive and full-bodied dancing.